By most measures, the agency I lead is a success. For 40 years, Alternatives has served the needs of adults with developmental or psychiatric disabilities. Beginning in Uxbridge, Massachusetts, in the heart of Blackstone River Valley -- birthplace of the American Industrial Revolution -- we've grown from a three-program agency serving 26 people, to one with nearly 60 programs serving 2,000 people throughout Central Massachusetts. Back in 1976, we employed 15 staff. Today, we provide jobs for 725 employees, who help the people we serve live successfully in group homes or apartments and find meaningful volunteer and paid positions. In order to provide these opportunities, we've had to battle the stigmas, stereotypes and ignorance that people with disabilities often face. But it's time for a confession: For more than half our history, we were only doing half our job. Perhaps that sounds too harsh. After all, Alternatives has earned high praise from national accreditation bodies and won awards for its work. And I cannot imagine any more rewarding career than one spent transforming lives -- moving people out of state institutions and back into their community. But therein, as they say, lies the rub -- community. Fifteen years ago, we took a hard look at ourselves and concluded that for all the success we had enjoyed, we hadn't really tackled the most difficult challenge of all: Truly integrating the people we serve with their neighbors and fellow citizens, whose cooperation, generosity and acceptance are essential to our success. Too often, even when the individuals we served were physically living in their communities, most were not truly part of those communities. They may have had their own apartments, but they were largely invisible, and too often unwelcome. If they worked at all, it was generally doing piecework in sheltered workshops with other people with disabilities. They lived lives of isolation. Participating - people coming together by choice around some community interest or need. Contributing - sharing your gifts and talents within a valued role. Reciprocating - developing interpersonal connections where we can give and receive without "keeping score." Changing our dynamics to conform to those three words became the new focus of our work. Back then, Alternatives could best have been described as a "Bonding Organization." We were focusing our resources inward, being proud of the important services we were providing with little interaction with the outside world. It was clear that if meaningful strides in community membership were going to be made, we needed to become more of a "Bridging Organization," a collaborative force focusing our energy outward to embrace people across social boundaries. So, we began to build relationships with non-human services community organizations and social groups. We networked more. We posed lots of questions about community interests and needs. And we asked members of our communities to welcome their neighbors with disabilities into their lives. Together, people we serve and others in the community engaged in club activities or volunteered on community projects such as community gardens, the restoration of a playground, and a one-act play festival, which were sometimes funded by Alternatives' Community Bridging Grants. As an organization, we became committed to being a good neighbor and corporate citizen. 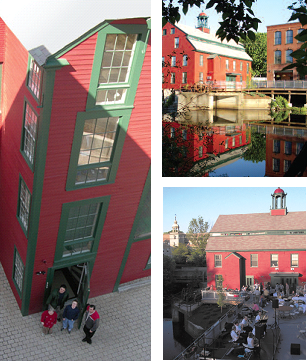 We also closed our sheltered workshop in the historic Whitin Mill, and began an ambitious project that would ultimately transform the Mill into an inviting space that would welcome residents, business leaders, and elected officials throughout the area to engage with us more deeply and to learn more about our work and mission. The Mill, located in Northbridge, Massachusetts, is now home to our administrative headquarters, a community plaza, art gallery, and performance center. The restoration married modern needs with the complex's historical sensibilities and was completed using green technology that enables us to generate 90 percent of our power needs onsite. The space we created is in high demand by area businesses, local officials and community organizations for meetings and events. Most importantly, the Mill has become an inclusive arts and culture magnet, bringing thousands of people of all abilities together each year to enjoy art shows and classes, dramatic performances, and family concerts. All of this is helping to build our social capital -- the resources available to individuals through their relationships and membership in community organizations. When social capital increases communities become stronger: Places where isolation, fear, ignorance and stereotypes are reduced, while trust, knowledge, friendship and economic growth can flourish. It's a huge task. It may be one with no real end. As long as human beings exist in all their diversity we're going to have work to do. Dennis H. Rice is Executive Director of Alternatives in Whitinsville, Massachusetts.